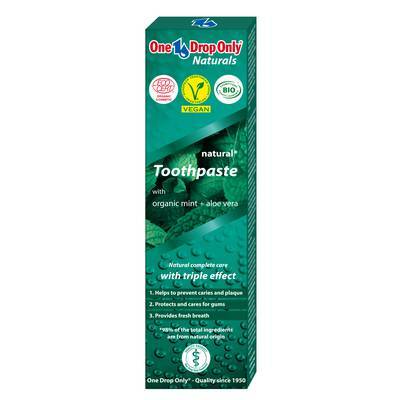 The One Drop Only® Naturals toothpaste with essences of mint and aloe vera from organic agriculture protects against caries and plaque. Protects and cares for gums. Provides a long-lasting, clean and fresh mouthfeel. SORBITOL, HYDRATED SILICA, AQUA, MENTHA PIPERITA LEAF WATER*, ALOE BARBADENSIS LEAF JUICE*, LAURYL GLUCOSIDE, XANTHAN GUM, AROMA, SODIUM FLUORIDE, SODIUM BENZOATE, STEVIA REBAUDIANA EXTRACT, POTASSIUM SORBATE, CITRIC ACID, LIMONENE, CI 77891.